Taxes aren't as intimidating as you think, especially the first time around. If you've never filed taxes, it can seem pretty intimidating. But it's really not as bad as you think. Arm yourself with some basic information before reporting to Uncle Sam. Earned income - Salaries, wages, tips and professional fees, including taxable scholarships and fellowship grants. Unearned income - Investment-type income like interest on your savings account, dividends and capital gains, as well as unemployment compensation. Gross income - All income you received in the form of money, goods, property and services that is not exempt from taxes. Exemptions - A predetermined amount of money you can deduct from your taxable income for basic living expenses. You, as an individual, may be an exemption, and dependent children (which you probably are to your parents) qualify as exemptions. Standard deduction - A set amount of money that the federal government gives you if you meet certain stipulations. It differs according to marital status. Itemized deductions - There are six main categories of expenses that can be deducted: medical and dental, taxes, interest, charitable contributions, and casualty and theft losses. Itemized deductions reduce the amount of tax you owe. W-2 Forms - Wage-income forms that you receive from employers in order to prepare your taxes. Filing status - Whether you are single, married or head of household. There are several sub-categories within each of these as well. Depending on your gross income, you may or may not be required to file. For example, in 2008, all single individuals under 65 with a minimum gross income of $8,950 were required to file. Even if your parents (or someone else) can claim you as a dependent, you may be required to file if you meet certain income conditions. When determining your income, be sure to include all taxable income you receive. If your scholarships are not taxable, you need not include them in your income. (Non-taxable scholarships carry no service requirements and are used to cover education-related expenses). But if your scholarship money is paid in exchange for teaching, research or other services, it is taxable - even if you don't receive a W-2. This includes work-study income and pay you receive as a teaching or residential assistant. "Students really need to know that even though they might not be required to file, they may have some withholding taxes from a job," says Ted Knapp, an Internal Revenue agent in Mount Vernon, Ill. As a student, your income probably won't reach filing minimums, but you're still having taxes withheld by the federal government. "If you file, you'll likely get that money back," he says. And if you don't, then the government will gladly keep it. 1040EZ: The simplest tax form; consists of a single page. Requires a taxable income of less than $50,000 and interest income of less than $400. Restricted to singles and couples with no dependents. Cannot itemize deductions or deduct IRA contributions. 1040A: A more complicated form, allows more flexibility in income sources (including pensions, IRA dividends and retirement benefits). Also requires a taxable income of less than $50,000. Cannot itemize deductions but can deduct IRA contributions. 1040: The most complicated form, sometimes called the "long" form; required if income is more than $50,000. Can itemize deductions to adjust income. 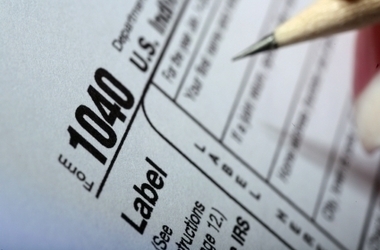 For most students, the Form 1040EZ will suffice. If you're not sure and want to include more sources of income and deductions, you can always file one of the more complicated forms. If you itemize your deductions, you'll also have to complete Schedule A of your 1040. The federal governments allows you to deduct certain specified expenses from gross income. The result is a lower tax base - and less tax that you have to pay. You'll need to fill out the 1040 if you want to itemize deductions. You should itemize your deductions if they total more than your standard deduction (the standard amount you deduct from gross income on the 1040EZ and 1040A forms). However, certain people must itemize even if their deductions are less than the standard deduction. For example, you must itemize if you are married, but filing separately and your spouse is itemizing; or if you are a nonresident or dual-status alien. The deadline for taxes is April 15 after the year for which taxes will be filed. "You can get an automatic four-month extension," Knapp says. "But this is not an extension for paying. It's only an extension to file. If you know you're going to owe taxes, you still have to pay by April 15. The IRS now has a 24-hour, 7-day toll-free number to help answer questions during the tax crunch period. The number is 1-800-829-1040. You can also call this number to get the location of the nearest IRS office. You can get free tax assistance at any IRS office. "It's probably a good idea to make an appointment," Knapp advises. He also encourages everyone to look for help online at www.irs.gov. Learn the basics for how to file, and come next April, you can file your taxes with ease.